Now that the clocks have moved forward one hour the next Members’ Observing Session will be in late September. 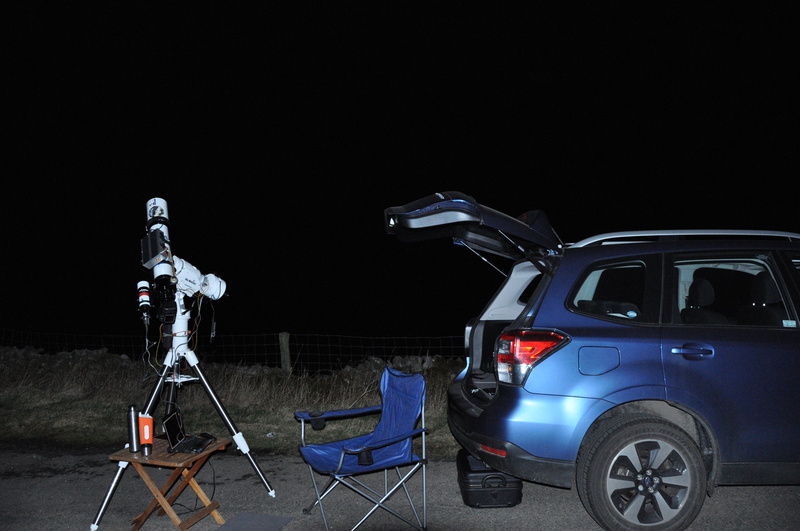 We still need volunteers to organise a few future Members’ Observing Sessions. 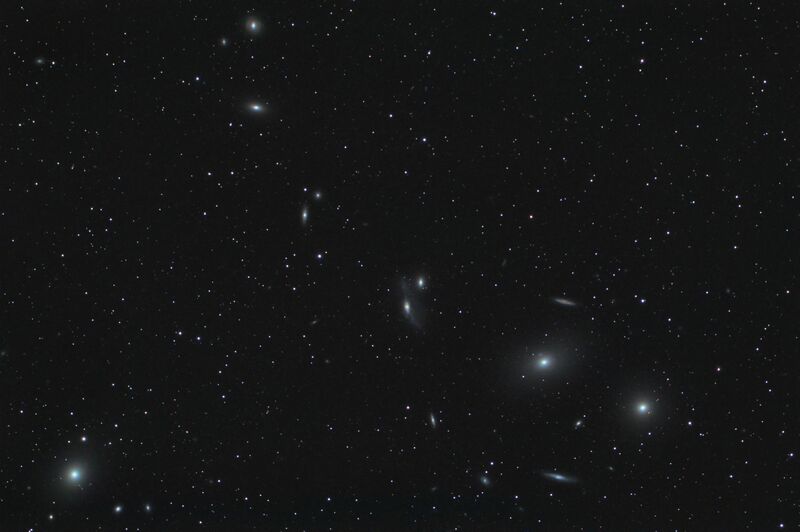 Virgo, rising at 9 PM, contains Markarian’s Chain and the galaxies of the Leo Triplet including M65 and M66. the Ursa Major constellation (The Plough) is almost directly overhead above Leo again including many galaxies. M81 and M82 are very close together above the ‘saucepan’, and M51 the Whirlpool Galaxy [and actually in Canes Venatici] is just below the end of the ‘tail’. At the end of February Hayabusa 2 took a sample from the sub-surface of the asteroid Ryugu after an orbiting module fired a bullet at the surface. 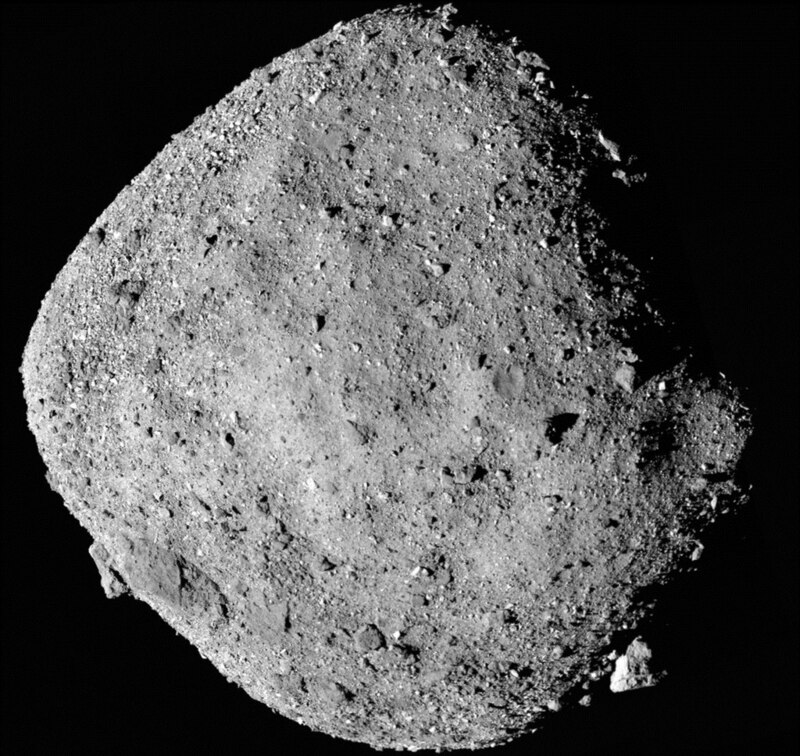 The meeting was shown a comparison between Ryugu and Bennu, the target of the OSIRIS-REx mission . While similar in shape, Ryugu appears smoother and more rounded than a typical asteroid and proves to be hollow and totally lacking water. By contrast, Bennu contains water and volatile molecules possibly from the early solar system. While cosmological distance determines age the opposite does not have to be true. 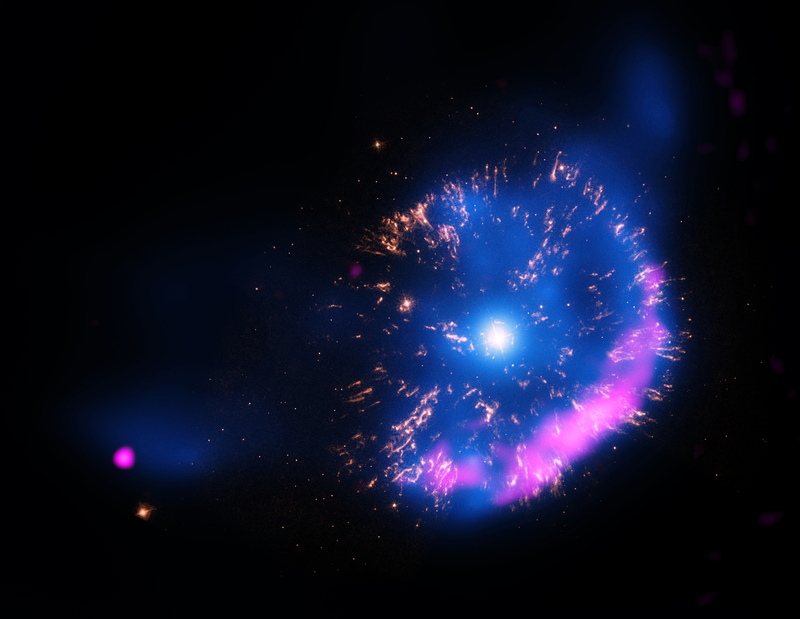 Some of our faint satellite galaxies prove to have been among the first formed in the Universe. Furthermore, a star does not need to be far along the in its life before the first planets a formed. From the lack of any elements heavier the Helium, the young HR8799 already has four giant, exoplanets. A member gave a talk on the history of the Drake Equation proposed in 1961 to estimate the probability of another civilization in our Milky Way. 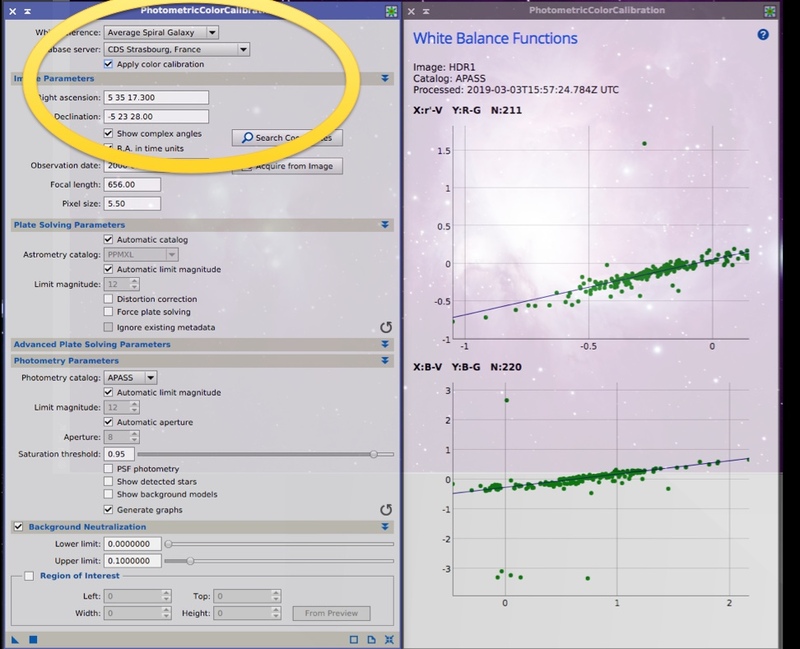 Since its proposal, we now have much more quantifiable numbers for factors such as the fraction of those stars that have planets some factors. Nonetheless, many factors, such as the fraction of planets that could support life that actually develop life at some point are still highly conjectural. EAS member Stuart Atkinson gave an illustrated talk with images from the Apollo programme rarely publicised. Only five images exist of Neil Armstong on the first moonwalk. 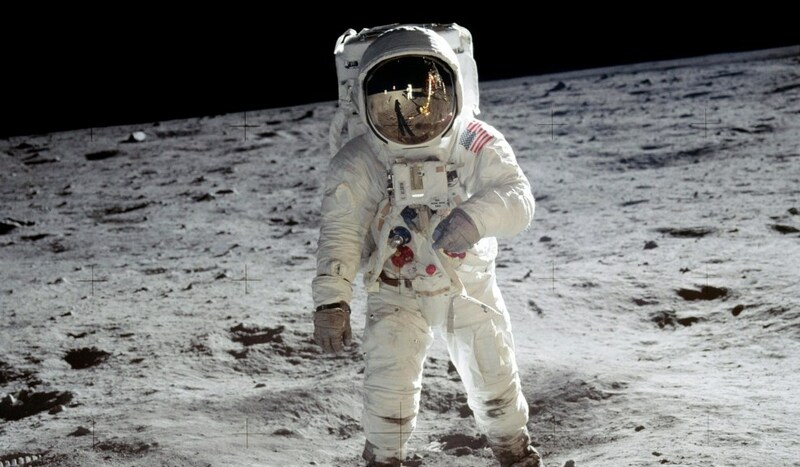 Other than the reflection of Armstrong in Aldrin’s visor the other four only show parts of his body. 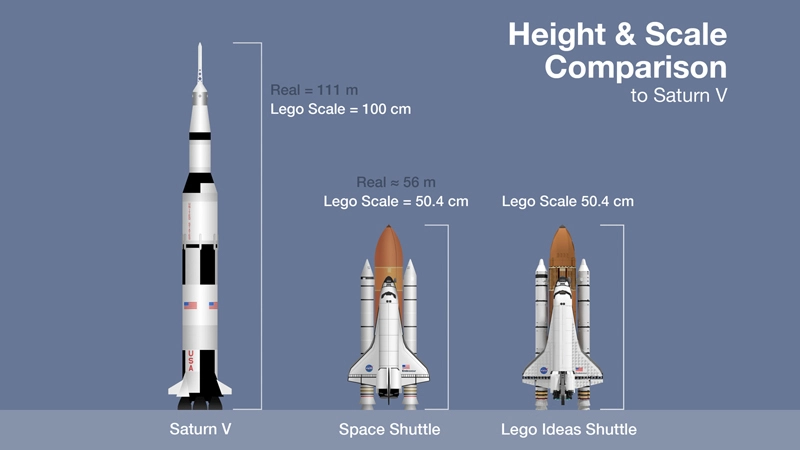 Among a number of lesser-known facts, the size of the Saturn V rocket to launch the modules and their engines to the Moon as compared to the more recent Shuttle. An appeal was made for volunteers to organise future Member’s Observing Sessions after this month. One of our members gave the first of a series of short talks on opportunities for amateurs using radio equipment. After a brief history of Radio Astronomy, the possible motives were listed. The natural phenomena of meteors, Jupiter, the Sun and associated Aurora can be monitored together with satellite communications. Although radio astronomy can be carried out during the day at frequencies above 30MHz, frequencies below this are either absorbed or reflected back to earth or back into space by the Earth’s ionosphere. When sunspot activity is low after sunset there is an opportunity to listen to frequencies below 30MHz from space when the F layer of the ionosphere can fade a few hours after sunset. It is then possible to hear radio emissions from Jupiter between 15 and 38MHz. An example of how to listen to meteors was given, and later some theory to explain why radio waves at different wavelengths are able to penetrate different media . 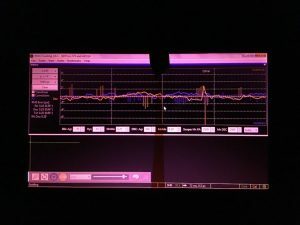 An explanation on different antennas was given with an example of a simple YAGI antenna showing how this and Dishes are able to increase the Gain of a signal and improve the signal to noise ratio. The presentation finished with brief examples of equipment which will be discussed at later presentations. 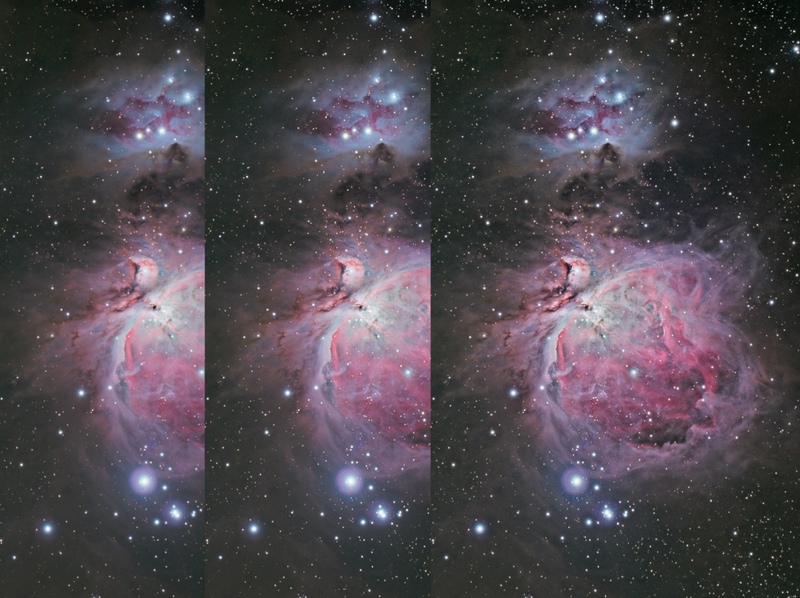 Orion only a few more weeks. Betelgeuse at Right Ascension of 6 hrs sets six hours at the Equinox on the (1830 on the 21st). Our EAS member, Richard Rae, visited Complex 39A at Cape Canaveral ( the Appollo 11 launch pad) for the launch of the SpaceX Falcon 9 rocket which is now the workhorse for vehicles to and from the International Space Station. 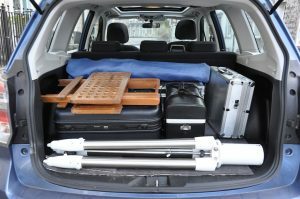 Simon White gave an explanatory talk with illustrations of the process of doing astrophotography – from loading the kit into the boot of the car…..
….. to the final photographic image of The Orion Nebula. Chairman’s report on the work of the committee over 2018. Chairman stood down and a new committee was elected making seven members in all. Chairman for 2019 to be selected at the next Committee meeting. 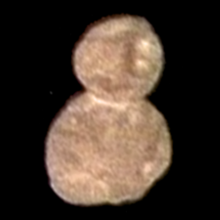 After the flyby of Pluto last year, a few days ago the New Horizon mission encountered the most distant object ever visited and returned images of Ultima Thule from the Kuiper belt. Thule is about 31 x 19 km and looks to be two objects that coalesced into a snowman shape. See also: NASA’s Mission to Pluto and the Kuiper Belt. On the 3rd, China’s 1.2 ton Chang’e 4 probe made the first landing on the far side of the moon. After touch down a 140kg rover was deployed. A satellite is being kept in a high orbit, around a theoretical Lagrangian point, relaying all the comms between Earth and the remotely controlled lunar vehicles Chang’4 Relay Satellite. Part of the exploration programme will be to return samples to Earth by Chang’e 5 and Chang’e 6 Chinese Lunar Exploration Program. The society has a number of telescopes available to members for as long as the member wishes to retain and keep them in good condition. One exception is the recent donation of an 11″ (28cm) Schmidt-Cassegrain. 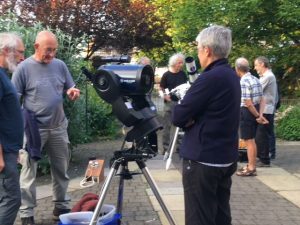 EAS is sharing the telescope with Cockermouth Astronomical Society where it will be available to EAS from late December to late June each year. Dr Osborn gave a talk on his work on providing instrumentation for the world’s large, optical telescopes. 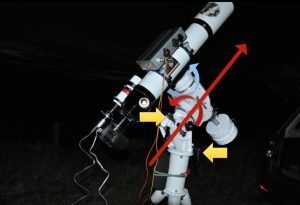 The marked rapid introduction of atmospheric distortion from a small to a large telescope was illustrated where the star images in the latter visibly oscillate. Astronomers and engineers are developing adaptive optics technology to remove such atmospheric bouncing and blurring so that scientists can see distant objects more clearly. 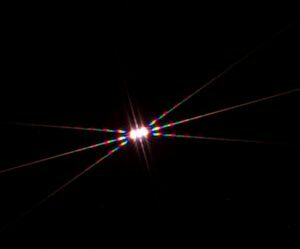 The disturbance to wavefronts from the target area is measured by using a laser to excite sodium atoms in the atmosphere to create an artificial star-like object. 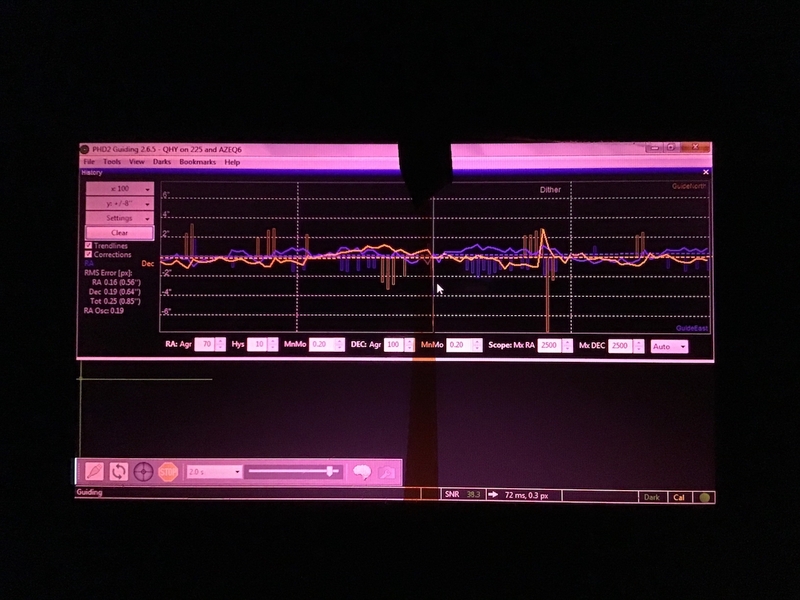 Fibre optic communication systems relay measurements of the distorted return signal to computer systems that control the telescope correction equipment. 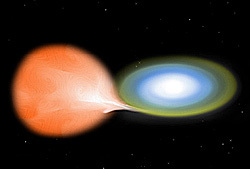 The AO system corrects the atmosphere distortion of the wavefronts from this artificial star in real time by flexing mirrors at a kilohertz rate to compensate for the atmospheric turbulence in the direction of viewing. 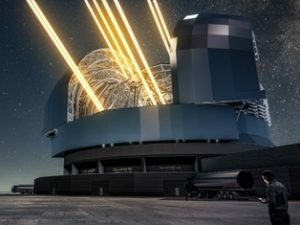 Conformation and calibration of the laser systems are achieved at sites by a number of proved systems around the large telescope. Q&A was informative. Included in that was the fact that in many parts of the world where large telescopes are located there is no need to warn aviation when launching 20 watts of laser light into the sky. The chairman welcomed members and guests to the November meeting. A Celestron telescope of some vintage has been donated to the society. Currently, the telescope is being renovated, mould removed from the tube and optics, to be used at EAS Observing Sessions. Astronomical Dark now begins before 7pm. Mars is the only feasible planet for observing this month and there are two periodic comets, one the target of last year’s Rosetta mission, that will be visible towards the end of November. See Sky Notes. 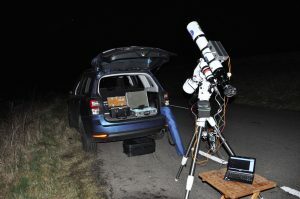 Check for the Observing Evening, page for the next member’s evening. Johanna Korndorfer presented a talk on the work of Friends of the Lake District to gain internationally recognised ‘Dark Skies Reserve’ status for the Lake District National Park. Concepts of Dark Sky Accreditation were introduced together with the implications for and actions to be potentially taken by authorities. In particular, ‘Core’ dark areas in the Lake District and surrounding ‘Buffer’ zones, where light pollution will impact the Core, need to be identified. Members were asked if they wished to help measure the sky darkness using light meters loaned to them by Friends of the Lake District. An extensive Q&A followed querying the implications for towns and rural communities. After a speaker cancellation, David Glass valiantly presented a talk on the progress of the probe Hayabusa 2, now in orbit around Type C (low metal mostly rock) asteroid Ryugu. Of the multiple propulsion systems, the Ion drive thrusters, with a force of micro-Newtons that consume a small amount of fuel over long periods, are deployed to adjust the inter-planetary transition orbit. The Ion Thrusters consume far less fuel than conventional thrusters. Hayabusa 2 will launch a number of deployable modules designed to land on Ryugu and bounce up to 15 times between measurements and experiments. A Small Carry-On Impactor weighing 2 kg will be ‘fired’ at a selected area of Ryugu to create a crater, while the main module hides behind the asteroid, where the sub-soil will be revealed as a target site for material sampling. 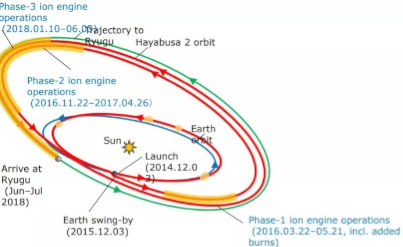 Hayabusa 2 will retrieve samples from the target crater and two other sites and then return a capsule of samples back to Earth. Finally, a member presented some recent astrophotographs taken in the Kendal area. The chairman welcomed members and guests to the October meeting and commented on the result of a recent feedback survey on how the club was meeting its expectations; news items and sky-notes were well received by respondents and lectures were reckoned to be set at a level “about right” for most of the audience. Mid October the skies are astronomically dark at 8:15. A general roundup was made of the many objects to be seen in the October sky. Lots going on! If the observing evening was not organised this weekend then it may be prudent to wait until around the 31st October when the skies were dark at 6:45 pm. Members were again reminded to check the web page, Observing Evening, on this site and not to travel to an observing evening unless the red text had changed to blue! 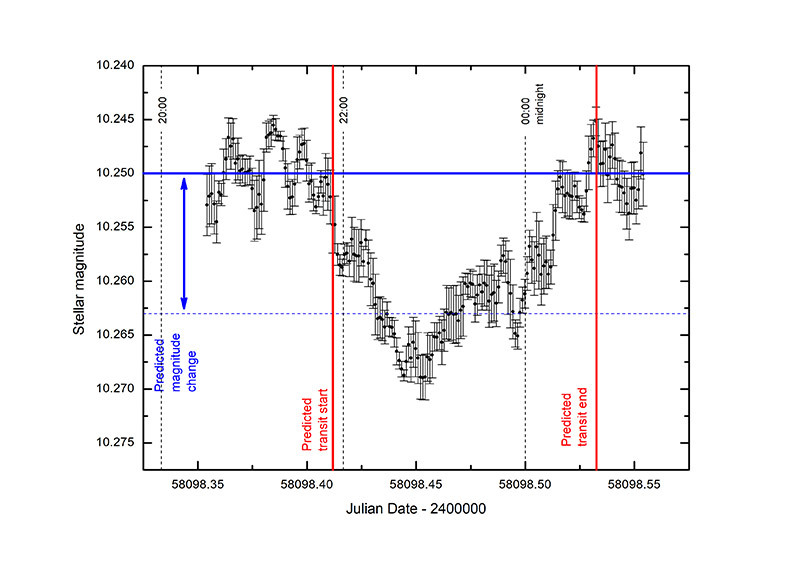 This exoplanet detecting satellite is now fully operational and monitors the change in luminosity of nearby stars that may indicate planets. 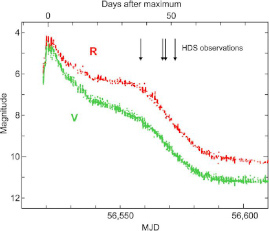 Proving to be very capable data is now being received from Tess that is characteristic of planets passing in front of stars. Further updates to follow. A recent photograph of Opportunity on Mars that has now lost contact with its project team. Analysed data from ESA`s Gaia surveyor has narrowed down where the interstellar traveller Oumuamua may have come from. The database combined with trajectory science has narrowed the source of Oumuamua to 4 stars within our galaxy. Bright objects on Ceres have now been associated with mud deposits. New research has indicated water and rock have erupted and may be responsible for the bright surface detail on the surface of Ceres. An interesting talk on the ancient volcanic lava flows on the moon and how there may be lessons to learn with Earth`s volcanism both in the past and in the future! IMP`s and RMDS were discussed at length. These are Irregular Mare Patches and Ring Moat Dome structures. 70 IMPs have been discovered 19 of which are around obvious vents. The recent research indicates there may be consequences for the Earth because we may be due a major basalt eruption on a scale of an extinction event. The far side of the moon has a crust that is 60% thicker than the nearside that faces Earth. Most volcanism occurred on the nearside face of the moon and occurred more than 1 billion years ago. Eruptions on the moon form dome shapes because there is no atmosphere. Sinuous rilles (look like rivers) form due to the thermomechanical erosion of the surface of the moon and can extend for several kilometres; the turbidity of the lava flow and a high lava discharge rate are key features in their formation. Ring-Moat Dome Structures (RMDS) are a newly discovered feature on the lunar surface; low domes surrounded by a shallow cavity or moat. Large-scale lava flows are now thought to have occurred on timescales much more rapid than previously thought. Theoretical models were discussed regarding their construction and magmatic foams were highlighted as a possible precursor. Over 2000 of these structures (RMDS) have been identified. 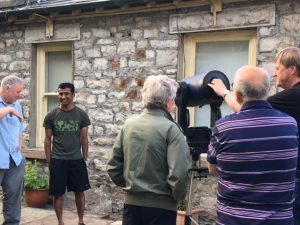 The chairman welcomed the Dark Skies Project Officer for the Friends of the Lake District and asked for volunteers to be a liaison to work for dark Sky Accreditation. A communication from Ullswater Yacht Club who are looking to open their grounds for the use of members. Members were notified of UCLAN public lectures in Lancaster and Preston during October 2018. Members asked to finalise their requests to visit Alston Observatory after the next meeting on Tuesday 2nd October. Arising from question Why Mars farther than other planets from Ecliptic last year. Planetary orbits are inclined to the ecliptic plane by up to 6° (maximum reached by the planet Mercury). The Ecliptic coordinate system, Celestial equator, Ecliptic and Celestial poles were covered as well as equinoxes. Not to be confused with the orbit shape ‘ecliptic’ the word comes from the fact that when the moon crosses the ecliptic we experience an eclipse. From the Ecliptic the meeting was focused to the constellations near to the Zenith, where starlight travels through the minimum depth of atmosphere to the telescope. By the middle of September, we will be experiencing 7 hours of Astronomical Dark from 9 PM. See Sky Notes in particular. Stuart gave an entertaining but informative talk that also warned of the dangers of false attribution of astrophotographs taken by members. Since the advent of digital cameras and post-processing software images are not only easy to fake, as opposed to the valid enhancement of target features. In addition, the internet has released a Pandora’s Box where the distribution fake images become impossible to control. Images were illustrated from obvious Artistic impressions being passed off as factual to the deliberate stealing of images. For the latter, defences were outlined such as ‘Watermark’ signing to the proven method of introducing errors. This Saturday, 11th August the Perseid meteor shower will occur on a moonless night. However, the forecast at the moment is poor. The NASA Parker Solar Probe is due to be launched this Saturday 11th August. The probe will fly into the solar corona and will investigate the Solar wind and the heating of the solar corona to very high temperatures. A pair of images of Neptune illustrated the gain in using new Adaptive Optics by the VLT. 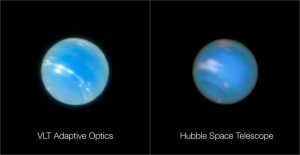 The images demonstrate that the VLT with the latest adaptive optics can be competitive with the Hubble Space Telescope. 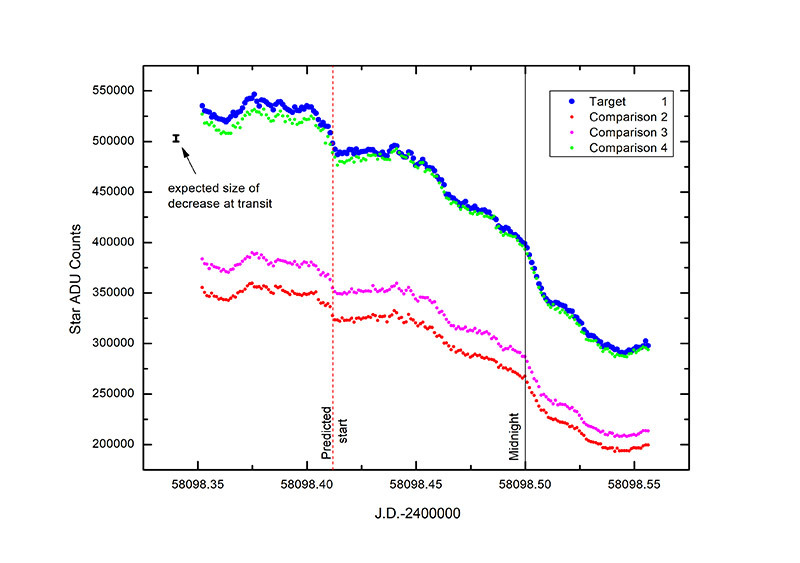 The new technology is also applicable to the future 40m-class telescopes (e.g. the E-ELT) and is essential to get the best out of these new assets. The MeerKAT interferometric radio telescope in South Africa can now produce science images. An image of the centre of the Milky Way was shown, which reveals new detail of unexplained filaments in the region. A member gave an Illustrated talk and demonstration to explain an orbit: throw hard enough until your ball goes over the horizon and continues to fall towards the planet at the same rate as the ground ‘falls away’ due to the curvature of the planet resulting in a circular orbit. The problem of manoeuvring without changing orbits was illustrated with the failed docking scheduled for Gemini 4 before their first spacewalk. From a distance, increasing speed by the trailing vehicle changes the vehicle’s trajectory into a higher and more elliptical orbit. Why is the night sky dark? A member’s talk described the paradox attributed to Heinrich Wilhelm Olbers ( 1758–1840). Given an infinite number of stars that compensate intensity decrease with distance, the night sky should light. Although the Big Bang specifies that the material in the universe is finite, there are more than enough galaxies to cover one per a pixel on telescopes in the foreseeable future making the paradox still valid. The currently the solution accepted is that space is expanding: thus, cooling radiation and shifting radiation towards the red and radio. Other explanations are also mooted. Infinite or not, the universe is of a size that means that even travelling as fast as they do, photons from some distant stars have yet to reach us. There will certainly be some redshift arising from the expansion of the universe, but this effect can be ignored by recasting the paradox in terms of radiation generally, rather than the much smaller visible spectrum. So irrespective of wavelength, the paradox is why there is not an infinite bath of radiation. The “fractal” explanation is a way round the homogeneous assumption inherent in the paradox, and as in the talk, the fractal calculations of the universe diverge from the required dimension. So I think we’re left with the “it hasn’t reached us yet” solution. And, of course, it never will reach us – but that’s a different talk. The types of astronomical telescope mounts were explained by a member: Altazimuth and Equatorial . Current ‘GoTo’ software offers the opportunity to iterate polar re-alignment. How accurately does the polar alignment need to be for time exposure photography? After much work and many calculations , our member discovered that the error reported by the software, for the polar misalignment, may be used as the drift across the image in 24 hours. Hence the rate of drift can be quickly calculated. 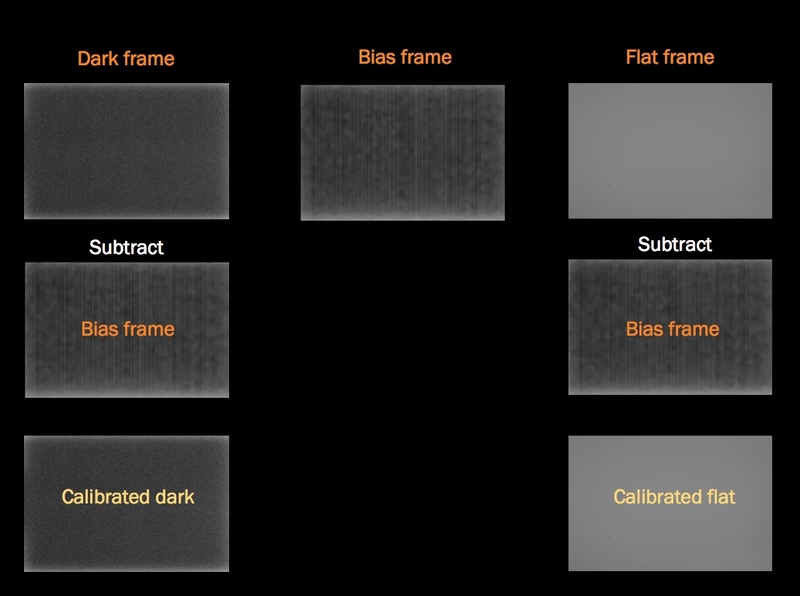 The pixel coverage for a given camera together with the focal length of the system can be used to determine the sky coverage per pixel, eg 2 arc seconds/pixel. The rate of drift can then be used to determine the time to drift across one pixel (or maybe more) to find the maximum exposure time for the reported polar alignment error. 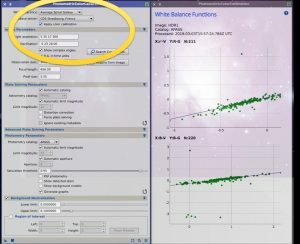 In summary, tolerance for the error in polar alignment can be calculated beforehand. The telescope polar alignment procedure can then cease when within the desired tolerance. 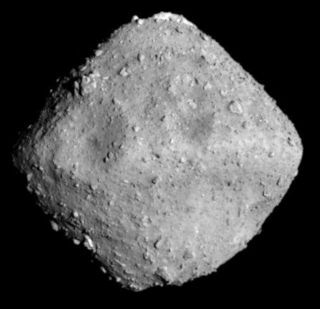 The JAXA spacecraft Hayabusa 2 successfully arrived at the asteroid 162173 Ryugu, on 27 June due to return material from the asteroid to Earth by the end of 2020. See also: Astro Bob. One of our members presented images of comets which may be viewed through a Stereograph. 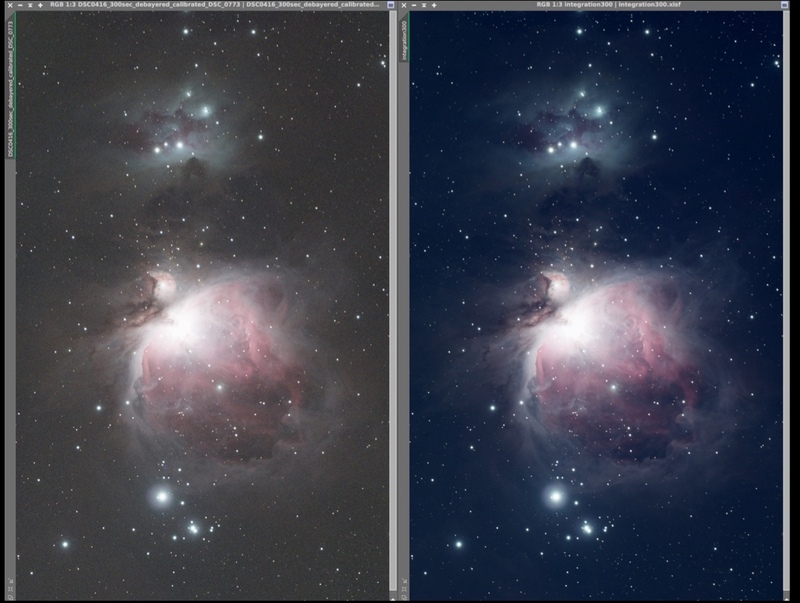 The main obstacle to Astro-stereo images is determining an adequate separation between two simultaneous images. 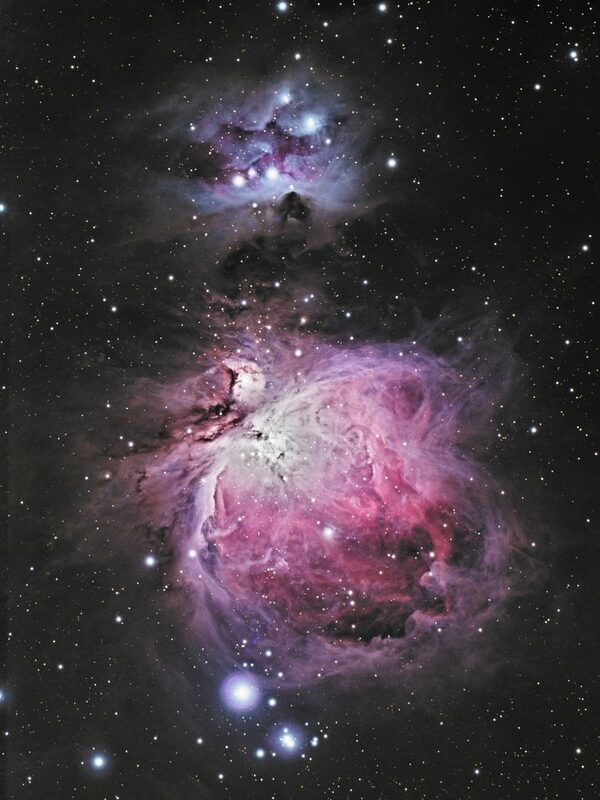 Images were displayed that had used overlapping times from a telescope in Spain and a telescope in South America. Also, a stereograph was available during the break to view a video gif of the displacement of a close-approach comet imaged from the Earth at two different times. Professor Wild gave an illustrated talk that progressed from the physics of solar storms, through a history of destructive storms to current developments to defend against the effects of a violent storm of electrically charged particles on our society dependent on electricity, electronics and satellite transmissions not forgetting long-distance space travel out of the Earths protecting magnetic field..
A sequence of early photographs of a comet showed the effects of a solar storm passing by in the background. Current forecasting of the arrival of one of the many storms from the sun is made difficult by only be able to view an approaching storm head-on, compared with the numerous meteorological stations used for weather forecasting, A number of satellites are planned to be placed in the Lagrangian points (parking places) relative to the Earth and the Sun that would be able to detect approaching storms from side-on. Implications for exoplanets were highlighted. A necessary condition for a planet to sustain life (see Goldilocks Zone) is that the planet must have a magnetic field – that will protect from charged particles released from the parent star.